They brought out the trumpets and the tubas and the bass drums yesterday for the NFL's annual announcement of its regular-season schedule. It was all anybody could talk about when they weren't talking about Don Imus or Larry Birkhead or Sanjaya or Pacman Jones. The league-owned NFL Network pre-empted its new reality series, "Hanging With Rich Eisen," to announce the schedule. ESPN, which has been known to send at least two reporters to cover one of commissioner Roger Goodell's morning jogs, had a 2-hour special to discuss the new schedule and determine its effect on global warming. ESPN labeled the release of the schedule a "new holiday." Can't wait to see the cards Hallmark comes out with to help us celebrate it. At a table in the back of his newest restaurant, Shula's 347 Grill, located in the Philadelphia Marriott West Hotel in Conshohocken, Don Shula shook his head in amazement as he talked about the $6 billion-a-year behemoth that the NFL has become. "I remember Super Bowl III," the 77-year-old Hall of Fame coach said of the epic game in 1969 that his heavily favored Baltimore Colts lost to Joe Namath's New York Jets. "When we got off the bus at the hotel, there were just a couple of reporters there. We walked over to the hotel lounge and I had my news conference there. Now, you've got 3,000 people covering the game. "It's unbelievable. I turned on the television a few weeks ago and they were televising the scouting combine. Guys pumping iron and running the 40-yard dash. People can't get enough." People can't seem to get enough of Shula these days, either. His 219-seat restaurant in Conshohocken is the latest addition to his steak-joint empire, which now numbers 26 across the country. 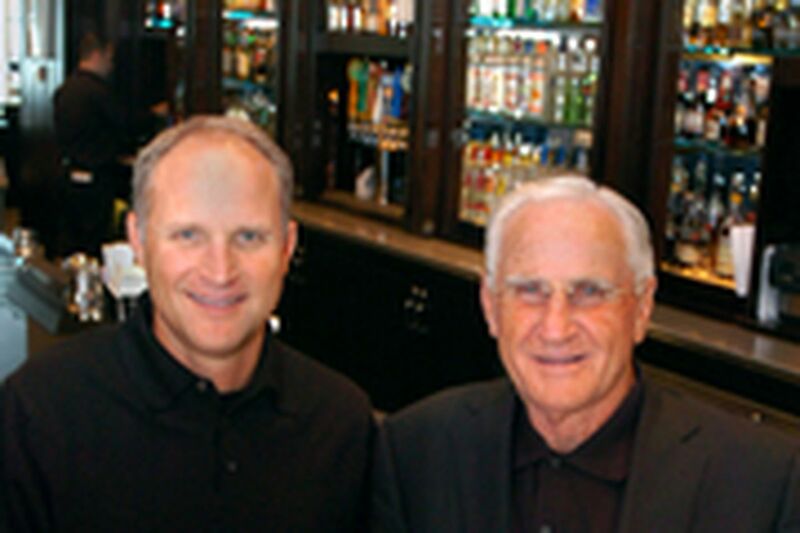 Shula's oldest son, Dave, who coached the Cincinnati Bengals for four-plus seasons in the early '90s, runs the restaurants for his father. When Shula isn't opening restaurants, he can be seen pitching diet food (NutriSystem) or hawking hearing aids or meds for hyptertension or playing golf or spending time with his 16 grandchildren. Dave knew long ago that his father never would be able to remember all of the names and birthdays of his grandkids. So he came up with an idea. Bought white-paneled footballs to put in the old man's office. "Everybody who comes in thinks they're game balls with the scores of the games on them," Shula said. "But they've got the names of my grandkids with their birthdays on them. Dave said, 'Dad, you'll never remember their names or birthdays. Now, you have no excuses.' Every time we have a new grandkid, we put another game ball up there." Dave is the oldest of Don and Mary Ann Shula's five children. Mike, the former head coach at the University of Alabama and now the quarterbacks coach for the Jacksonville Jaguars, is the youngest. In between are three daughters, Donna, Sharon and Annie. All five children were born in a 6-year span early in Shula's coaching career. "The Catholic way," Dave said with a smile. "At one time, when Dave was 19 and Mike was 13, we had five teenagers in the house at one time," Shula said. "We had more than a little excitement around the house in those days. "But it really helped me as a coach. As I got older as a coach, there was more distance between me and the younger players. But by having young kids at home and knowing what they go through as teenagers, that helped me understand young people better." Out of coaching since 1995, Shula got an opportunity to hang a whistle around his neck again in January when he and another former NFL head coach, Dan Reeves, coached in the East-West Shrine Game in Houston. "I was out there for a week," Shula said. "That whole week, there wasn't one guy who was out of line. They worked hard, did all the things we asked them to do. Clean-cut guys. I didn't see any difference [in today's players]." But he knows there are some. He reads the paper; he watches TV. He knows about Pacman Jones and Chris Henry and the dozens of other NFL players whose names have turned up on police blotters in the last year. He applauds the get-tough stance that Goodell and NFL Players Association chief Gene Upshaw are taking, which included a 1-year suspension for Jones and an eight-game suspension for Henry. "[Goodell] had to do something there," Shula said. "It's just gotten so out of hand. Fines don't work. They'll pay a fine and not even look back.